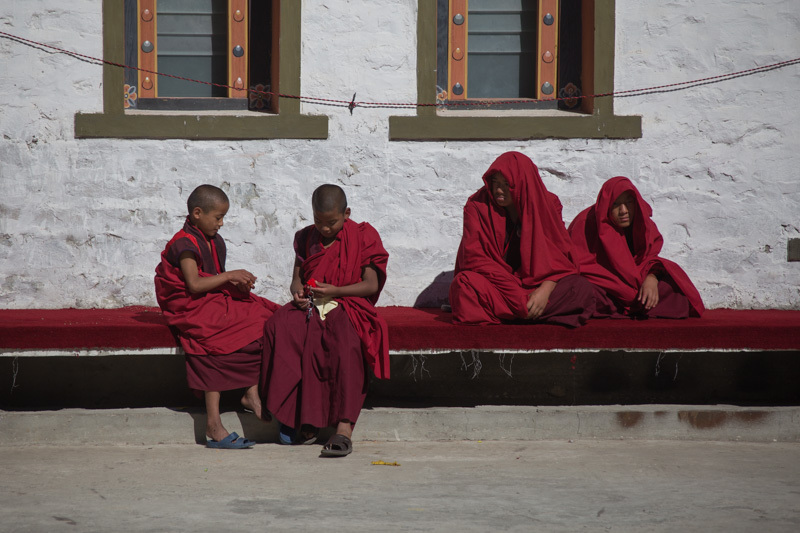 Our drive to Mongar was spectacular. The landscape was varied and we woke to one of those exquisite blue sky days after a cold blustery dry storm front the previous evening. 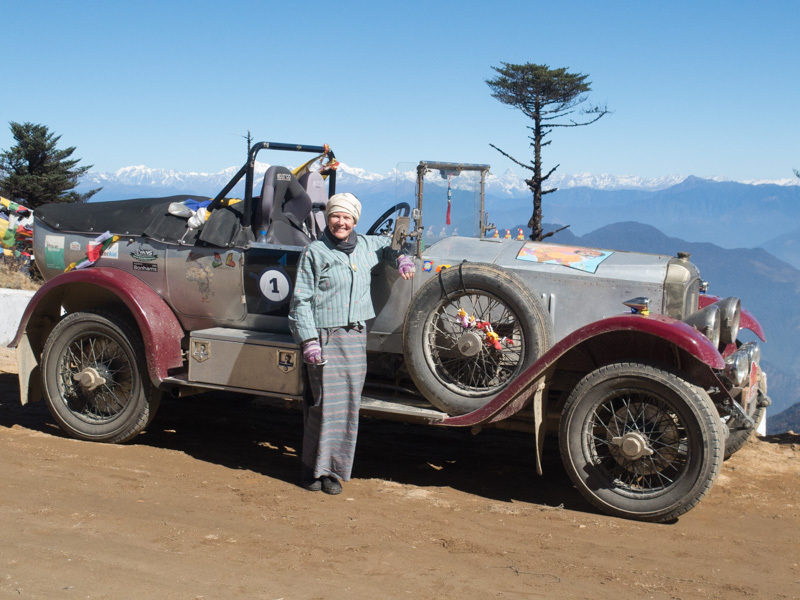 Our guide said he had often driven this road and rarely had he seen so far and it be so clear. 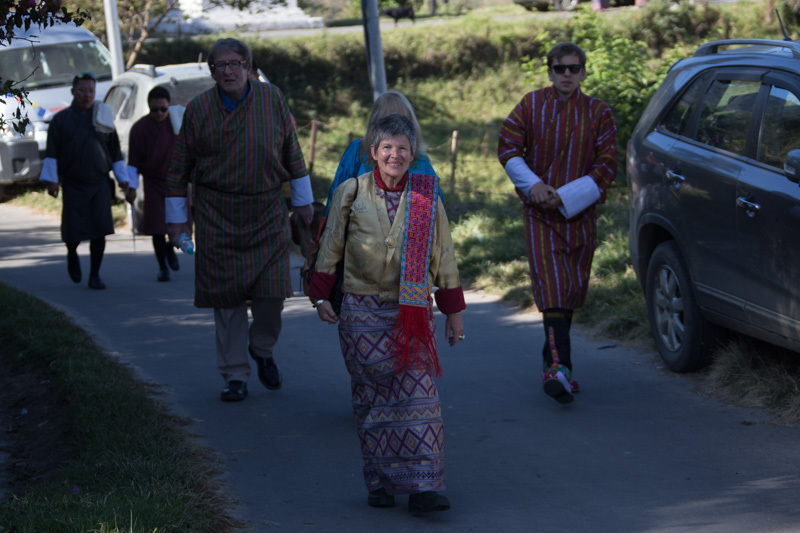 We were fortunate to see the highest mountain in Bhutan Gangkhar Puensum and the Eastern Himalayas which was absolutely breathtaking. 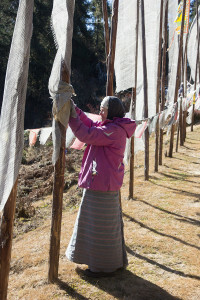 We also had many high passes which once again were graced with prayer flags which we contributed and I said my prayers to be carried with the wind. 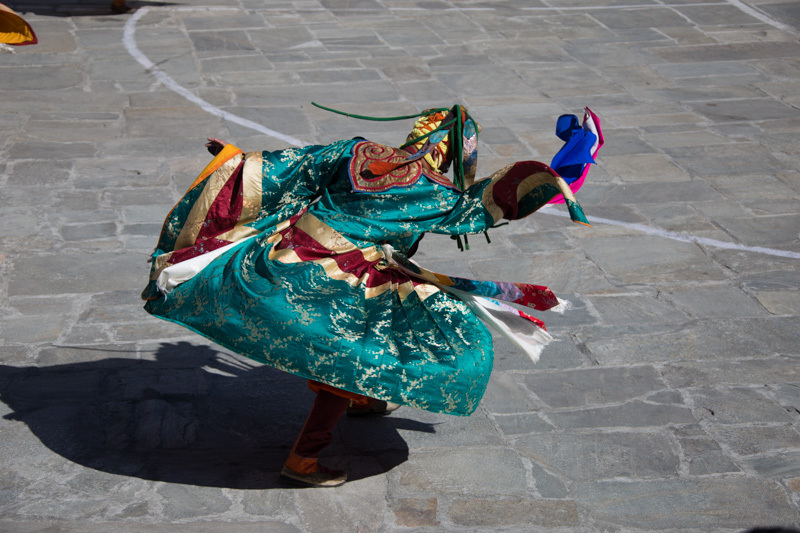 About midnight I heard drumming; singing and this long rhythmical horn. 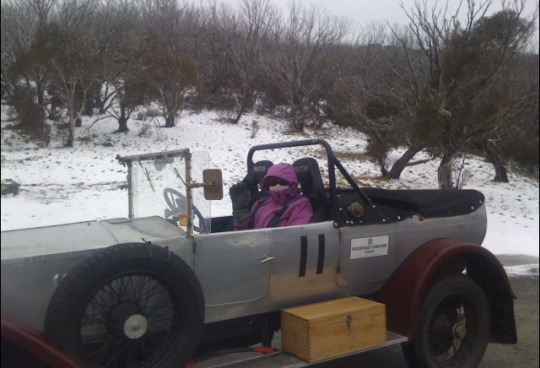 Something was happening in the cold clear night air. 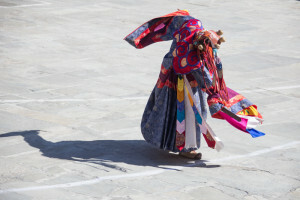 It was a little strange. 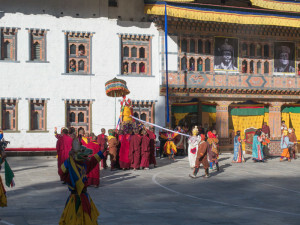 I looked out of the window and strips of coloured lights draped the buildings and flashed discordantly with the ritual sounds of monks chanting and bowls singing. I stayed up most of the night wondering what it could be… and who would be up all night (other than myself listening) … making such ceremonial sounds. 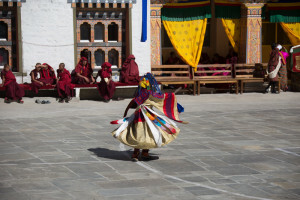 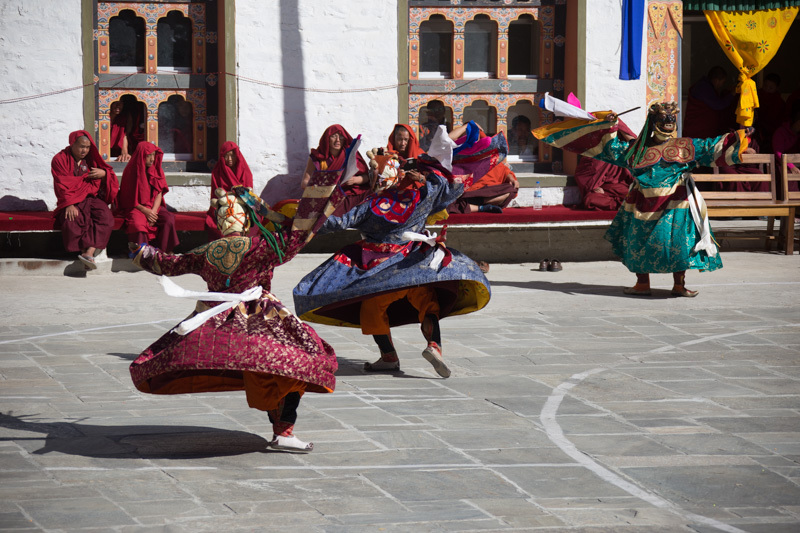 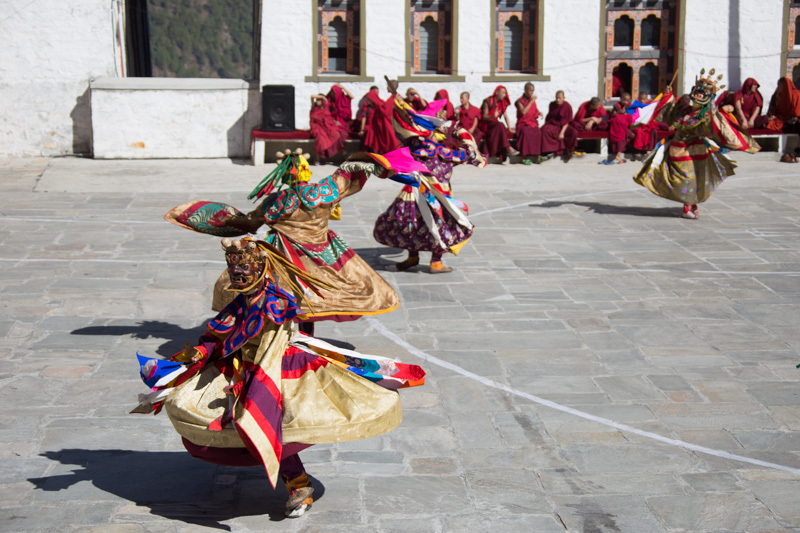 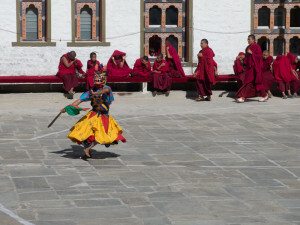 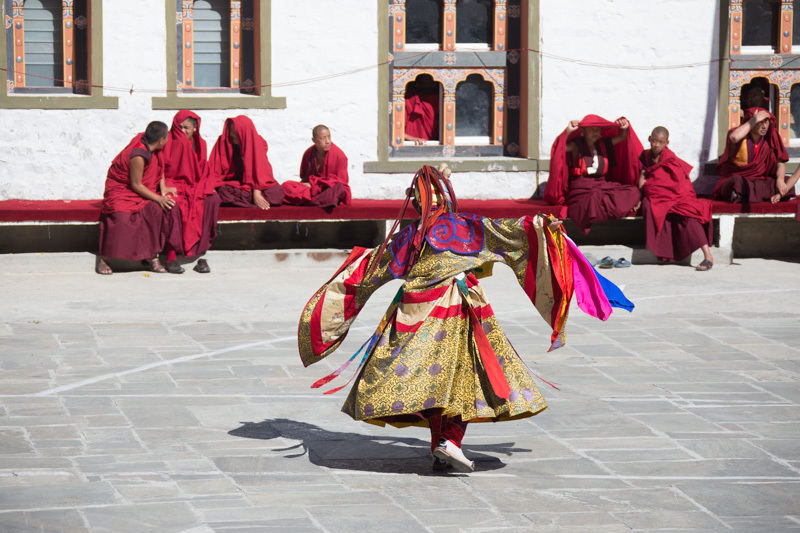 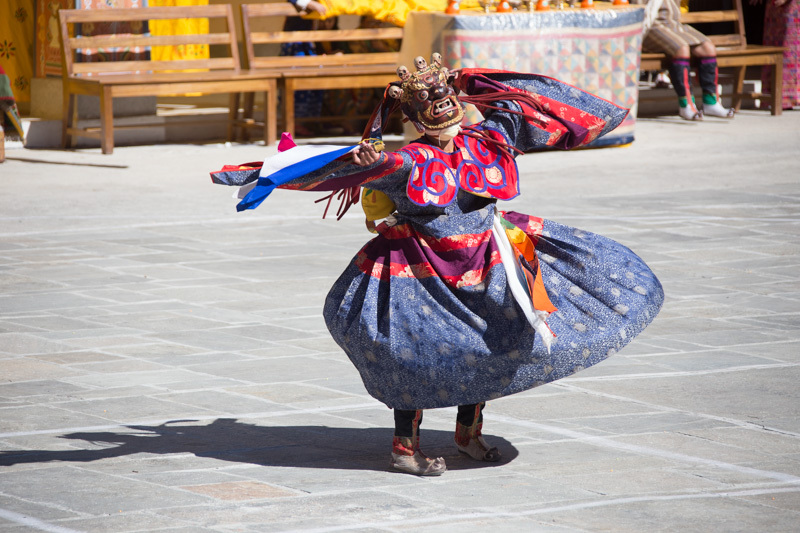 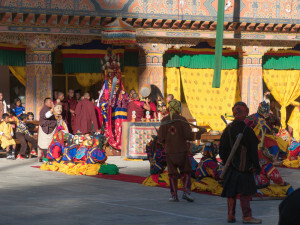 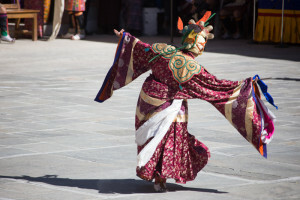 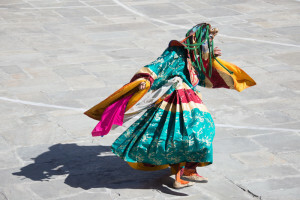 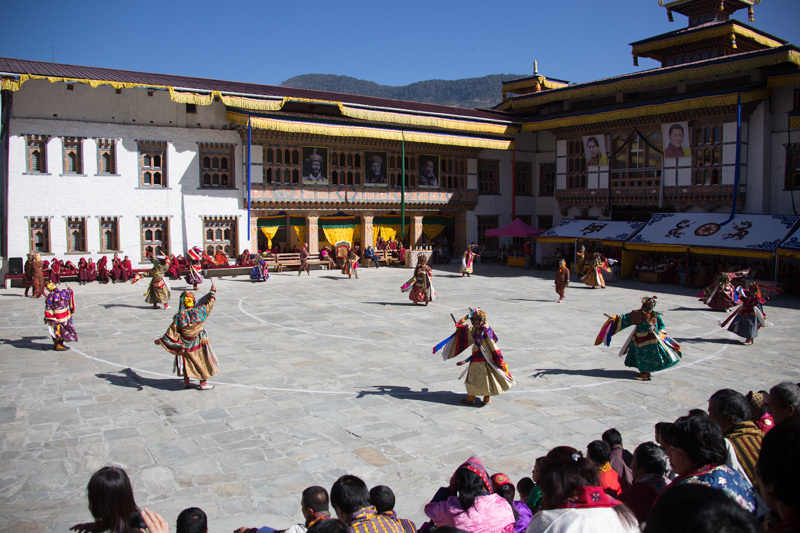 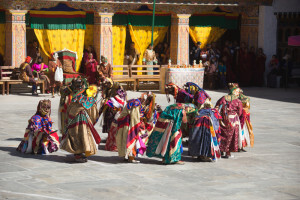 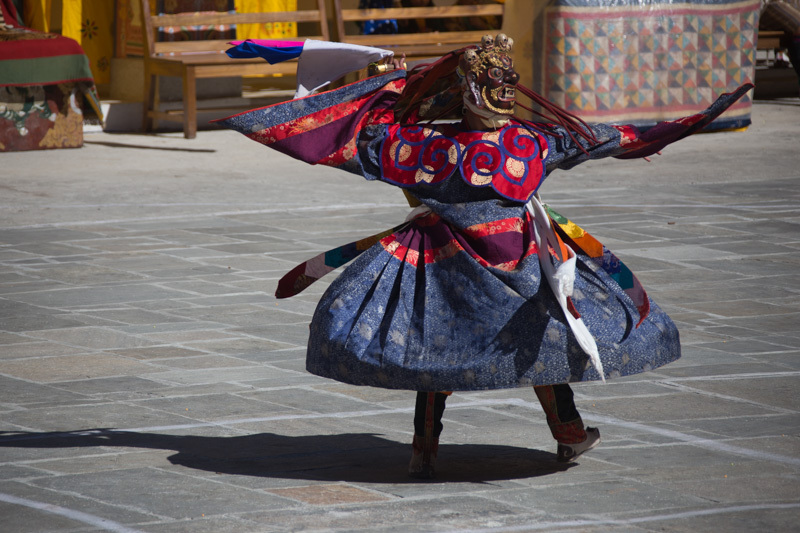 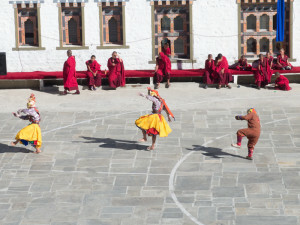 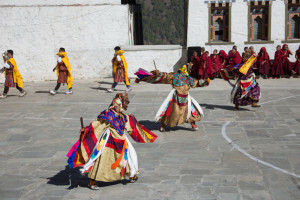 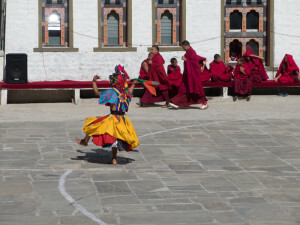 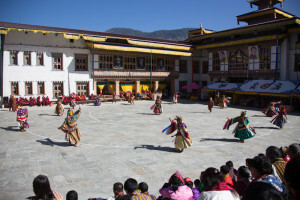 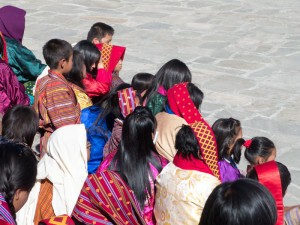 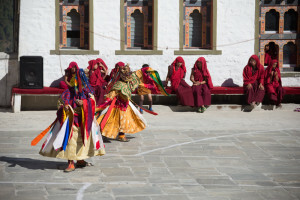 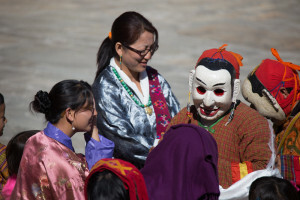 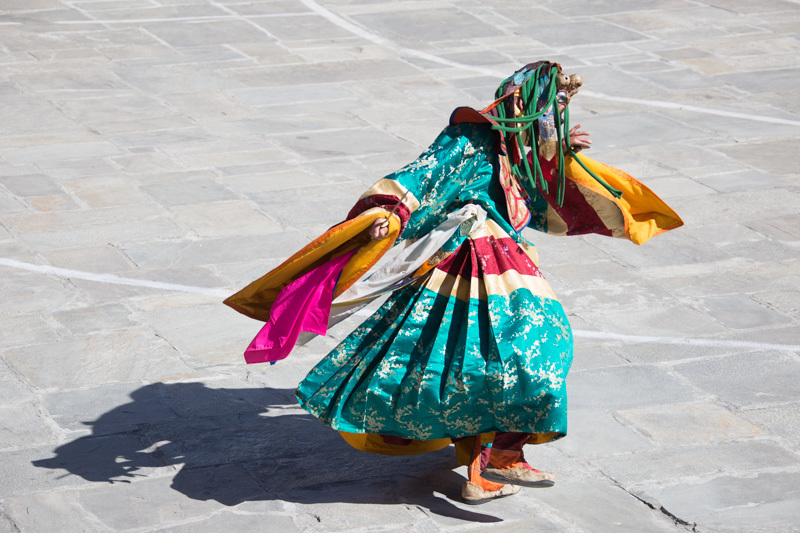 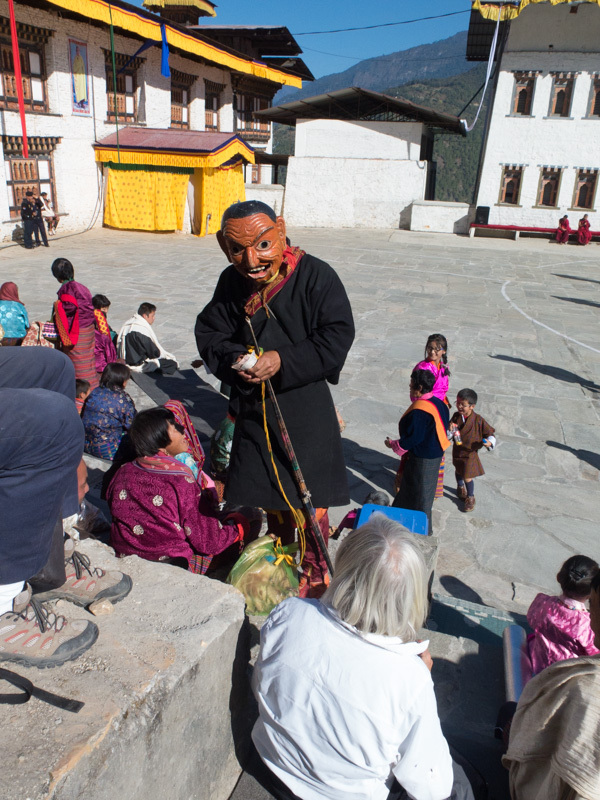 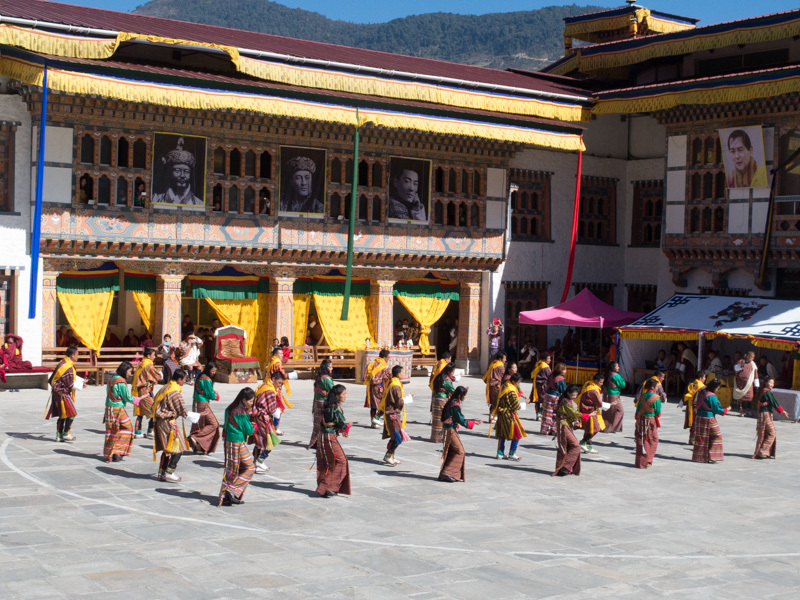 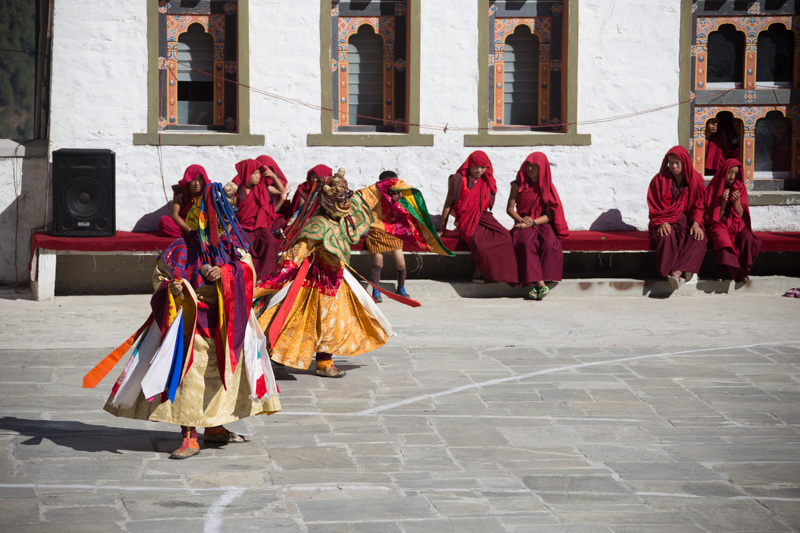 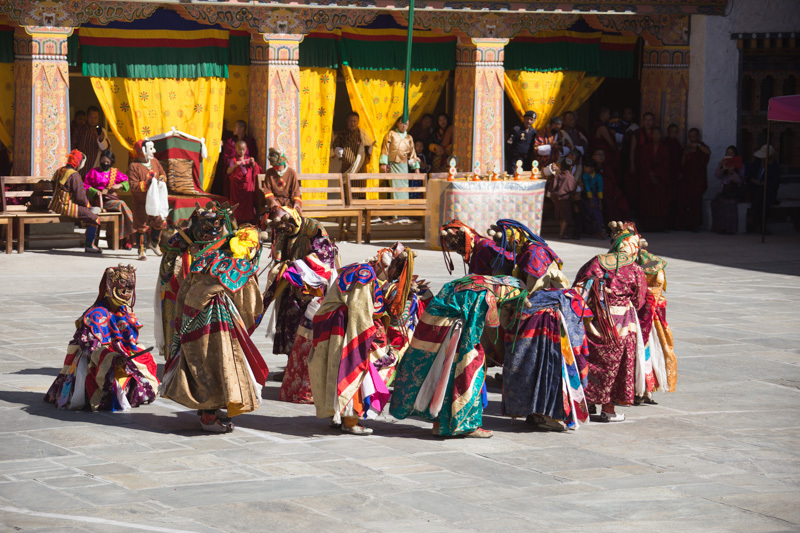 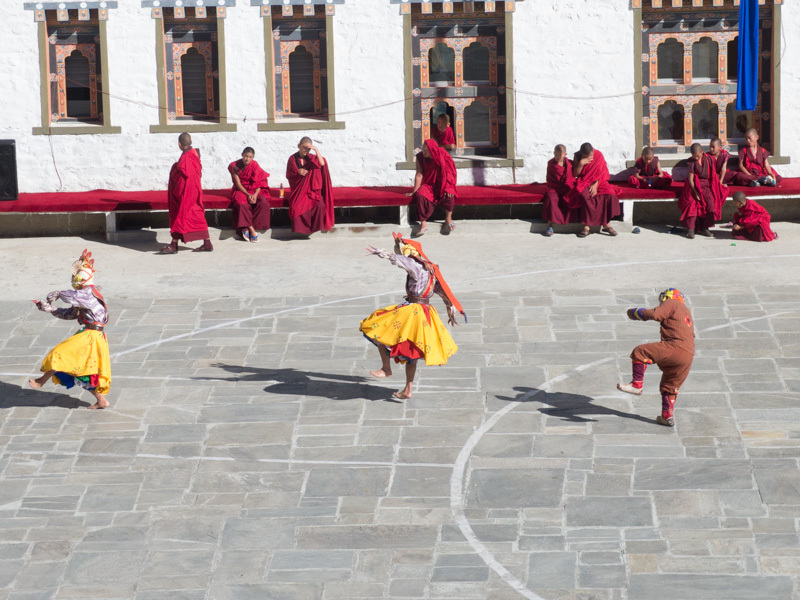 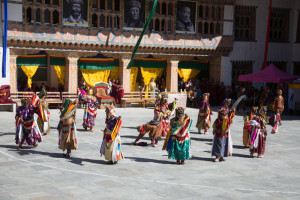 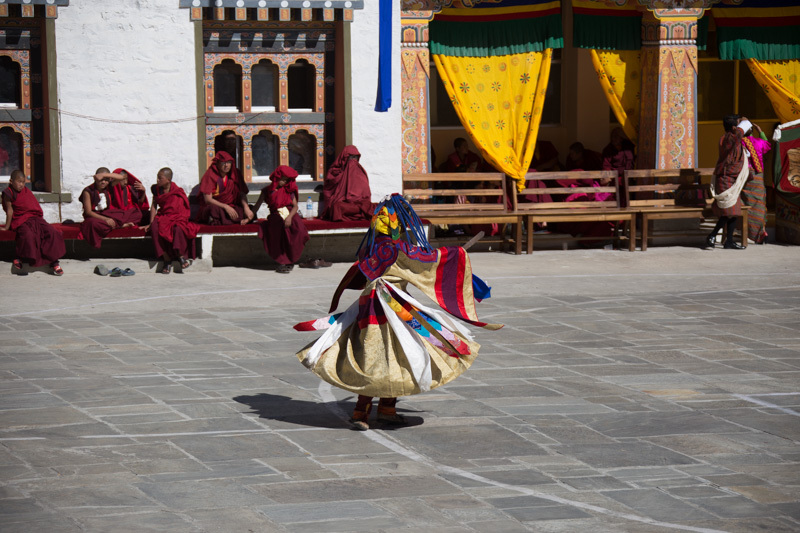 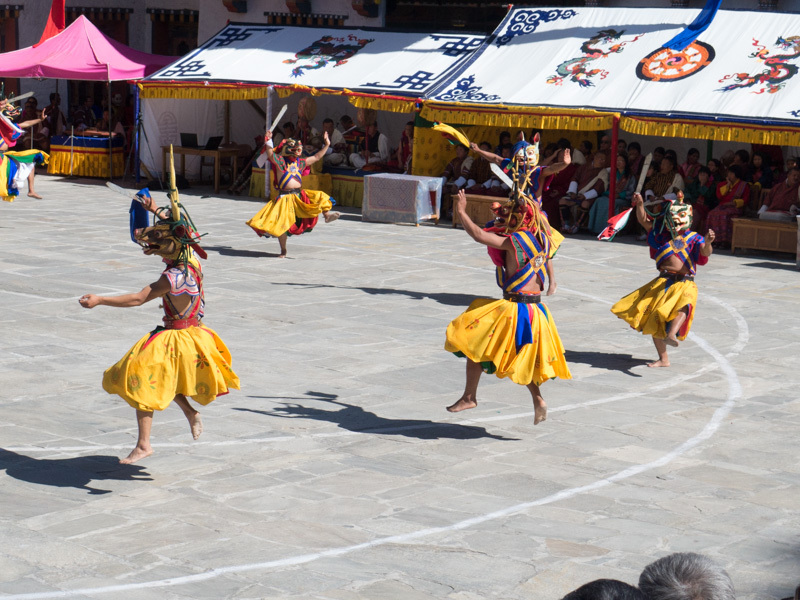 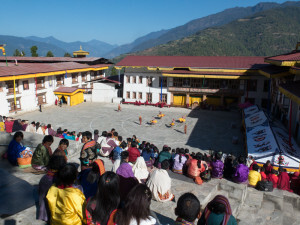 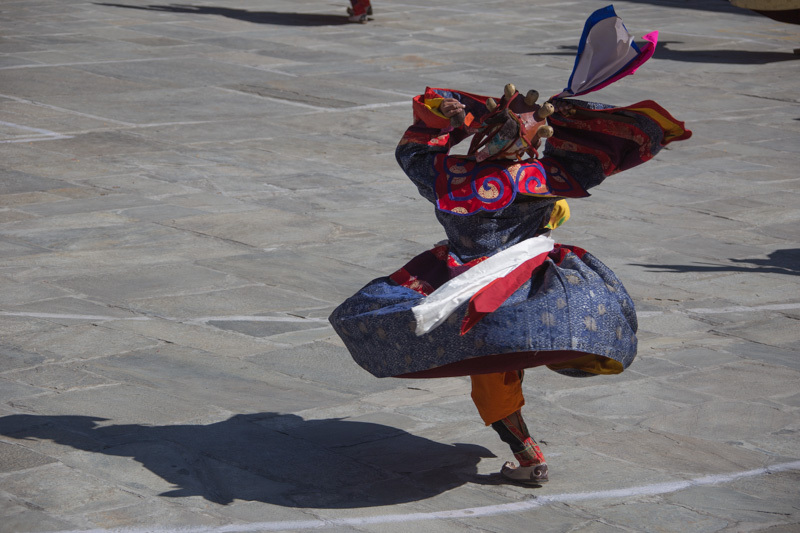 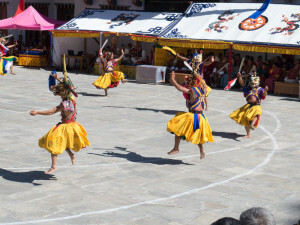 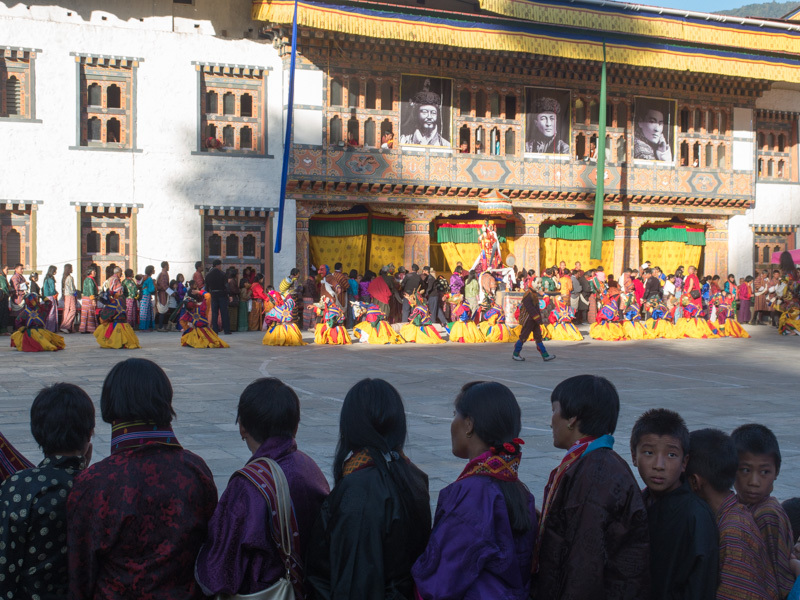 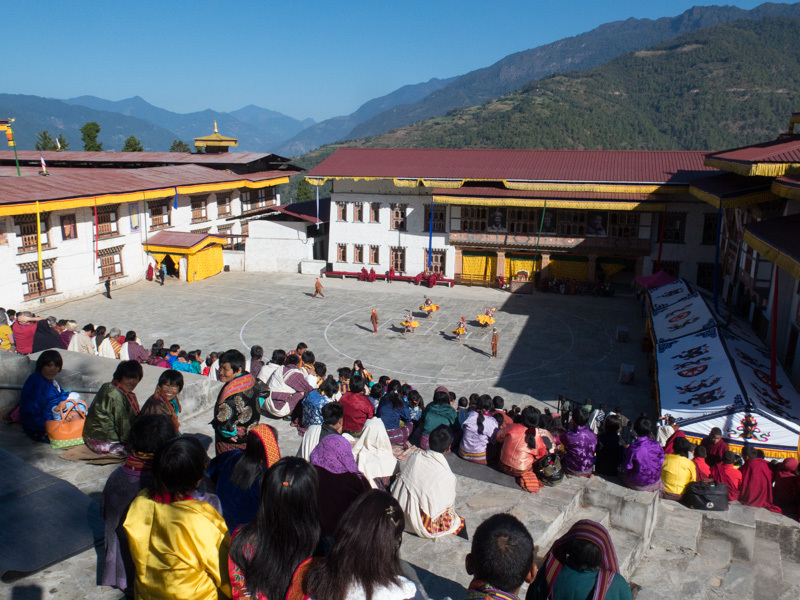 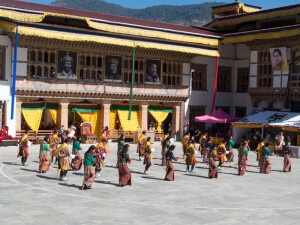 It all became apparent the following day when we participated in the local Mongar festival… which for me was an absolute highlight of my drive through Bhutan. 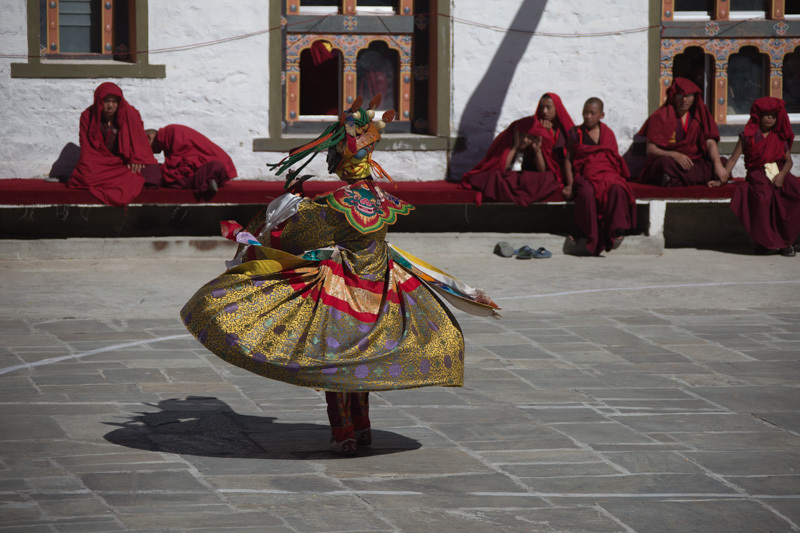 We all wore our ‘festival best’… I wore my ‘full silk Kira’ and Chimmi lent me one of her beautiful gold bracelets. 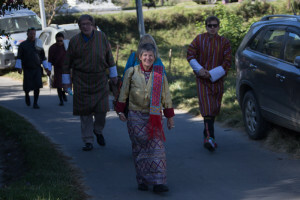 I felt ready to celebrate the festival our group of intrepid car rally-ists with the people of Mongar. 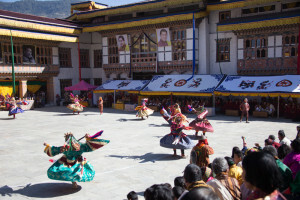 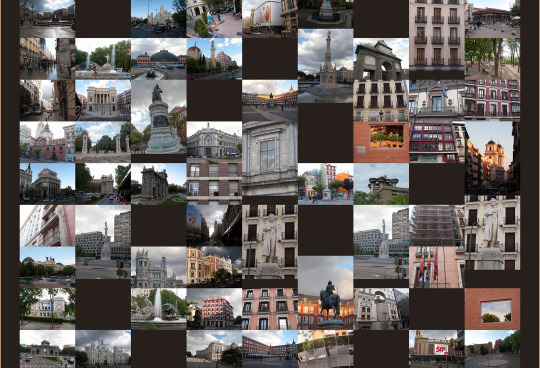 It is difficult to describe in words and even images what the festival was like. 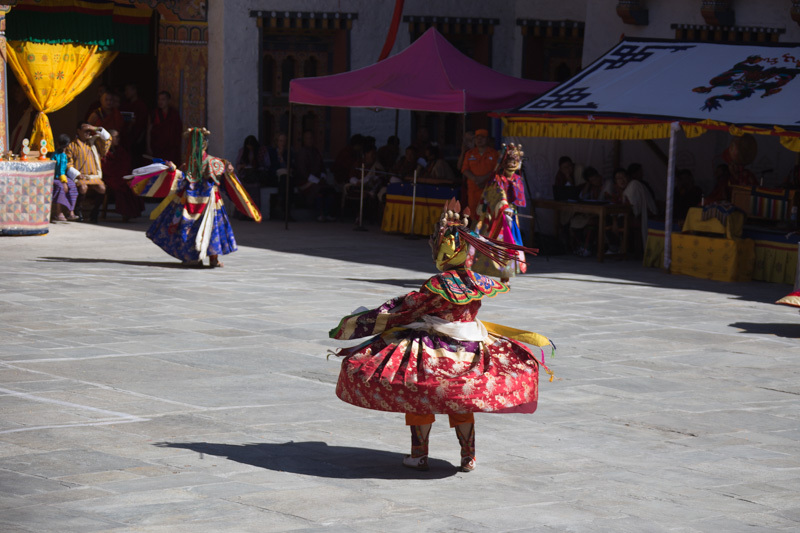 In the morning prior to a beautiful lunch, it was like watching the dancers tell traditional stories. 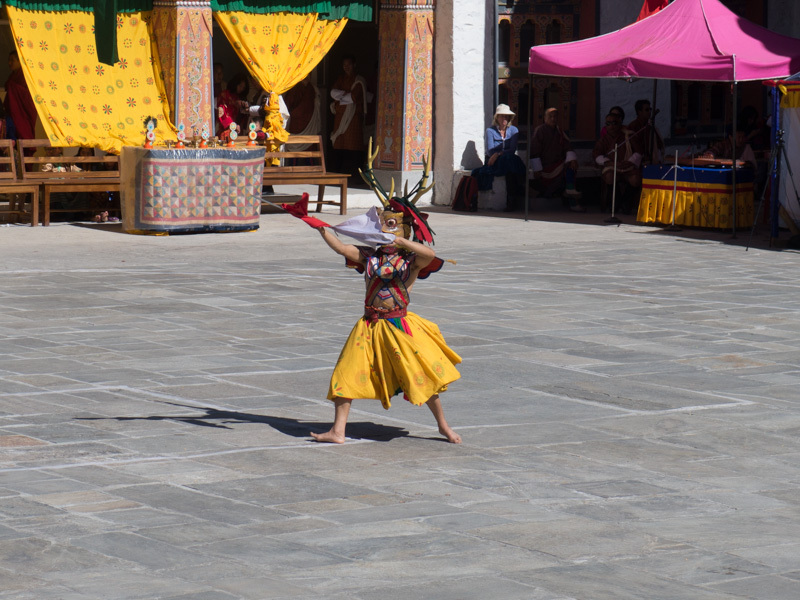 They were amazing..especially the male dancers who were spectacular. 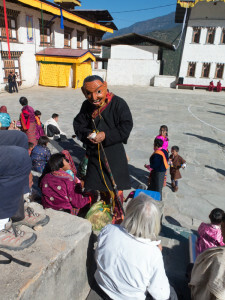 After lunch was when the festival really ‘sung’. 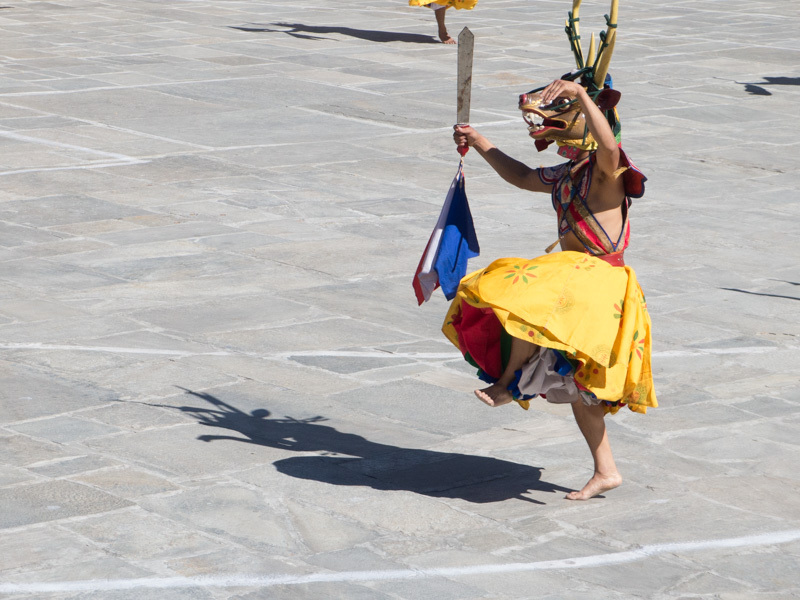 It was like Liz and I were participating in a ritual. 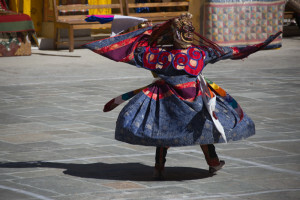 The dance was the most sacred of their dances; Bardo dance… (the Day of the Judgement). I honestly can’t explain how moving it was; listening to the music; watching the dancers move with such grace, passion and respect. 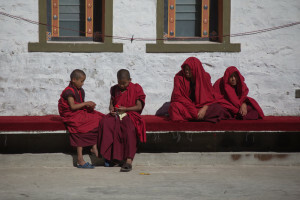 It was a profound day for me.